Starting its journey in 1995, Chevrolet Tahoe till date covered boulevard with its three generations. At the recent release of Chevrolet Tahoe LTZ 2015, Chevrolet proved the positive side of gaining experience. The fourth-generation SUV gets new revised look with a powerful engine that delivers better fuel economy. Let us have a look at the Chevrolet Tahoe LTZ 2015 review to know about it in detail. The interior of Chevrolet Tahoe LTZ 2015 is drenched in premium materials featuring superior finish. Inside you’ll find some extra space to make your rides comfortable. The infotainment section get commendable treat through eight-inch color touchscreen radio while the instrument panel gets a total new look. Dual tone dashboard looks elegant with its classy neat finish. All controls over the center console are well placed providing ease in operation. The interior isn’t just confined to comfort and luxurious looks but also brings tech upgrades. The major inculcation in this segment is with the optional 12 charging locations and entertainment system with dual screens for rear seat passengers. 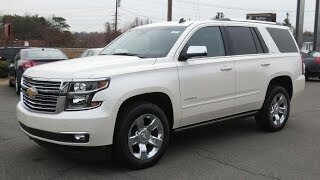 In all we found the interior of Chevrolet Tahoe LTZ 2015 both classy and innovative. The exterior of Chevrolet Tahoe LTZ 2015 is a lap ahead when compared to previous three generation models. Starting with the front fascia you have the dual-port chrome grille being separated by the Chevy logo in center. Sitting at both the sides of grille you have HID headlights inculcated daytime running lights. Bumper matches the body color with accents of black lining which at both its ends hold tiny fog lamps. The front end gets its wind up with the new aluminum hood providing looks and durability. Moving towards the rear fascia, changes are subtle with most of the parts keeping traits from predecessor models. However there is one thing you won’t miss and that lot of aggression and blend of classiness with the distinct looks offered in exterior of Chevrolet Tahoe LTZ 2015. The Chevrolet Tahoe LTZ 2015 gets a 5.3 Liter Eco Tec 3 V8 FlexFuel engine which is expected to generate total output of 355 hp and peak torque of 383 nm. As nothing has been revealed by the company, there is one thing that’s for sure and it’s the transmission. The engine of Chevrolet Tahoe LTZ 2015 mates to Hydra-Matic 6L80 six-speed automatic transmission. 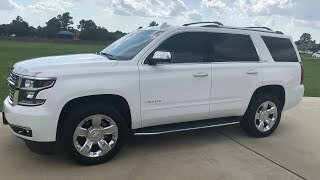 We expect you’ll stay with us till the time we don’t get any upgrades from the company in terms of performance figures of Chevrolet Tahoe LTZ 2015.